For Billy Hunter, there is not much physical distance between then and now. He only has to hop across the Hudson River, navigate the turnpike and stop at the outskirts of Philadelphia to arrive back in his hometown of Cherry Hill, N.J. In a winding career, however, Hunter has traveled to all sorts of far-flung stops to get to where he is now, in his office in the heart of Harlem, on top of Marcus Samuelsson’s new eatery, just a few buildings down past Sylvia’s. Since that meeting, neither side has blinked. There is no end in sight to a lockout that is nearing a month in duration. Despite an uptick in basketball-related income from $3.64 billion to $3.82 billion, league-wide losses were expected to exceed $300 million, a figure the union disputes. If each side maintains their current stance, Hunter said he believes the league’s owners will lock out players for at least an entire season. Some originally applauded the civility of both sides for agreeing to meet long before the labor agreement expired. In retrospect, the meetings only hinted at the deep fracture that existed back then. The weight of 450 players rests on Hunter’s shoulders. So is the external pressure &#8212 those from the players’ families, their friends and agents, some who covet Hunter’s job or think they can do it better and will be economically impacted once checks are missed. The 68-year-old Hunter is keenly aware of this gravity of the situation and feels better prepared after having already worked through one protracted lockout. He has readied the players, but to understand how this man readied himself for his high-stakes showdown with the NBA, it’s important to know a little more about Hunter and how sports have helped shape his life. Billy Hunter’s e-mails are signed off with the name G. William Hunter, but in Cherry Hill, he will always be known as Billy, the baseball player. The area was a manufacturing magnate — the Campbell’s Soup headquarters was located nearby. Hunter grew up on Main Street in a bustling four-bedroom house often shared with as many as 15 relatives. All of Hunter’s uncles played baseball. Hunter followed suit. In 1955, he was on the roster of one of the first integrated teams to play in the Little League World Series. Before traveling to Williamsport, Penn., Hunter’s team first played a regional in Front Royal, Va. Hunter and the team’s two other black players — Bob Cook, a cousin, and his best friend, Wilber Robinson — stayed with a local black family. The rest of the team stayed in a motel. Hunter recalls that he did not know if the three would get to play in the game. It was the summer of Emmett Till’s murder and racial tensions ran high, especially in an area not used to the spectacle of integrated sports. Before the game, Hunter said authorities informed his coaches of death threats made against him. The team took a vote on whether or not to participate in the tournament. In Williamsport, Hunter’s team faced a squad from Morrisville, Penn. New Jersey’s Merchantville lost in the championship in extra innings by the score of 4-3. Hunter returned home as a minor celebrity, but the experience at the Little League World Series had taught him a vital lesson — before, he had been aware of segregation but not completely conscious of its pervasiveness. “It exposed you as a young kid to the realities of life at that time in America,” Hunter said. “It kind of hardened you a little bit, so you were able to take some knocks, and you needed that. You had to get up. In high school, Hunter starred in four sports, but ultimately chose to play football at Syracuse. As a running back, Hunter followed Ernie Davis, the 1961 Heisman Trophy winner, and preceded Floyd Little, a future Hall of Famer. But Hunter was also making moves that would chart his path. With the memories of his Little League days as an impetus, Hunter led a petition signed by every black athlete at Syracuse stating that they would boycott playing colleges in the South that engaged in segregated seating in stadiums or arenas. Dave Bing, the future basketball Hall of Famer, signed the letter. So did John Mackey, Hunter’s roommate, a skilled tight end who would become the first president of the NFL Players Association. “Oh yeah [the petition] worked,” Hunter said. “There was no question about it. It definitely worked. They were scrambling, man. They didn’t know what to do.” Ben Schwartzwalder, Syracuse’s coach, noted how the team rallied around Hunter and named him one of its captains. After Syracuse, Hunter went on to a brief but eventful NFL career, in which he mostly served as a kick returner. He played with the Washington Redskins in 1965 and the expansion Miami Dolphins in his next and, ultimately last, season. In Miami, Hunter found an expansion team that shuffled players in and out. “[It was] like Grand Central station,” he said. When a few of the team’s veterans spoke out against racial epithets thrown around by team management, Hunter, a second-year player, stood up with them. Near the end of that season, Hunter broke three fingers in a cold game in Buffalo. The Dolphins, in turn, attempted to cut him without paying out the entirety his contract. Encouraged by the prominent lawyer Edward Bennett Williams, Hunter enrolled in Howard University School of Law. He later attended UC Berkeley’s Boalt Hall Law School, where he received his Master of Laws degree. He rose to prominence in California, ascending from a prosecutor’s position in the Alameda County District Attorney’s Office to the chief assistant in the San Francisco District Attorney’s Office. President Jimmy Carter appointed Hunter as the U.S. Attorney for Northern California in 1977. He was one of the youngest lawyers to ever hold the position and became entangled in several historic moments. He brought the first major federal cases against the Hells Angels and Black Panther Party. Hunter also prosecuted the surviving members who aided Jim Jones’ cult after the mass suicide of more than 900 people in Jonestown, Guyana, in 1978. Hunter visited Jonestown following the assassination of U.S. Rep. Leo Ryan. Hunter also recommended Patty Hearst’s sentence be commuted and visited Hearst while she was imprisoned. At first, Hunter perceived that his bosses simply wanted him to sign off on the decision. Hunter insisted on meeting an imprisoned Hearst, the granddaughter of newspaper publisher William Randolph Hearst, who was first kidnapped by the Symbionese Liberation Army and later sympathized with the militant group. In 1984, Hunter started his own firm, specializing in municipal finance and entertainment law. He represented MC Hammer at the height of the singer’s fame and later brought a case against the entertainer Bobby Brown. At the end of the trial, Hunter’s daughters wanted him to get Brown’s autograph for them. “He told me where to go,” Hunter said with a chuckle. This is Hunter’s 15th year as head of the players’ union. Given the length of his tenure, it is hard to picture him as a basketball outsider. But when he was first appointed back in 1996, that was exactly what Billy Hunter was. In the mid-1990s, the union had fractionalized. Then-head Simon Gourdine faced open opposition. A vote to dissolve the union failed in a vote of 226-134. Player representatives voted unanimously to oust Gourdine. Bing, now the mayor of Detroit, connected with Hunter at a reunion party and mentioned that the union could use someone of his reputation. Hunter beat out the agent Bill Strickland and Charles Bennett, once a financial advisor to the union. Hunter is the union’s fourth executive director. None of his predecessors missed games because of a lockout. This could be Hunter’s second time. Hunter says the owners are asking for the same concessions they asked for 13 years ago: a hard salary cap, shorter and reduced salaries, and a better split on basketball related income. “They are trying to do the same thing here that they did in the case of the NHL and they’re following the same blueprint. I know it, and I preached it time and again to our players from the inception. 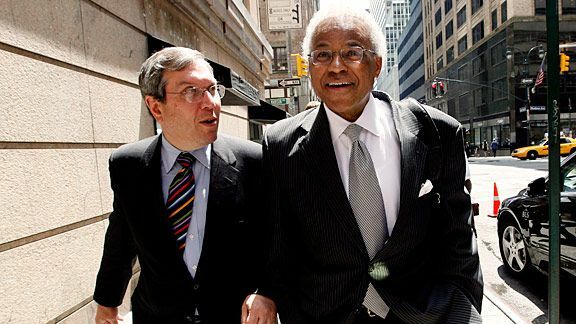 After years of deadlocked negotiations, Stern announced the start of 2011 lockout when the agreement expired on June 30. Defense-adjusted value over average, the Football Outsiders statistic that adjusts performance by comparing it to the league-average after adjusting for the down, distance, game situation, and quality of the opposition faced for each play by a team or skill position player.